AN HONEST LESSON IN NOT RE-INVENTING THE WHEEL! 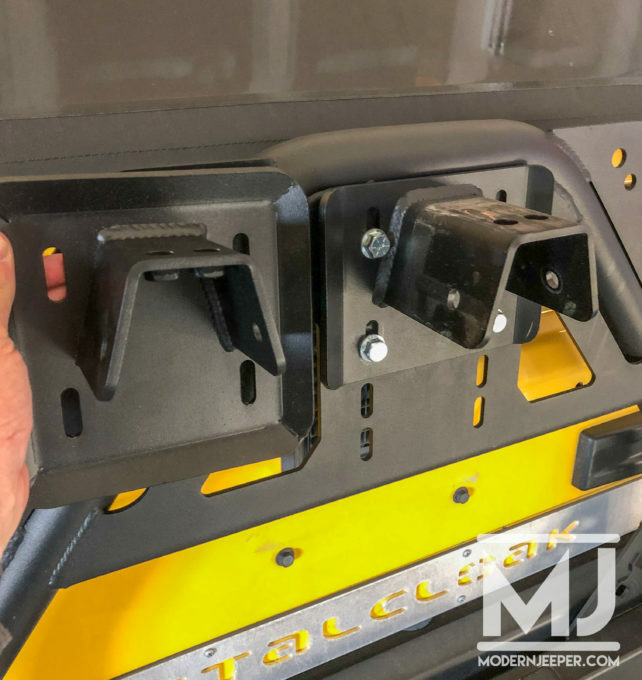 Upgrades to your Jeep can usually go two ways; the super easy, no thought involved, or the more common, this is going to take some thought route. I tend to be an over thinker. Imagine that! 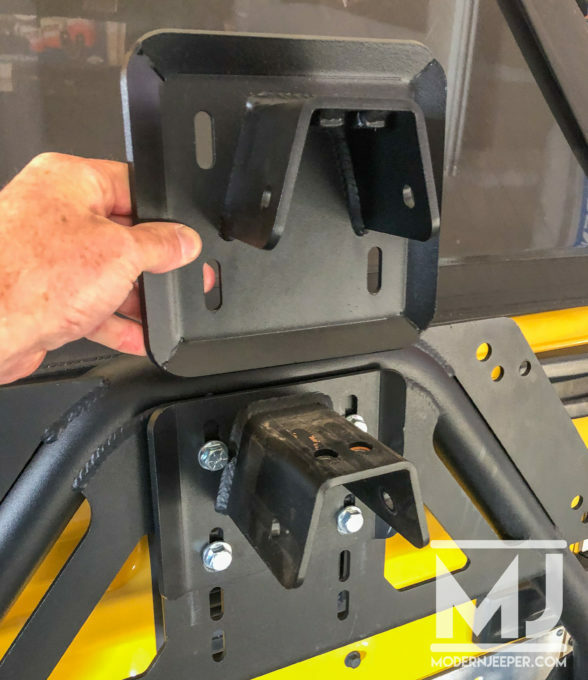 In the process of making the significant number of upgrades to Golden Spike, my new to me 2004 Jeep LJ, I left mounting the spare tire on the MetalCloak Rear Bumper Tire Carrier System until now. 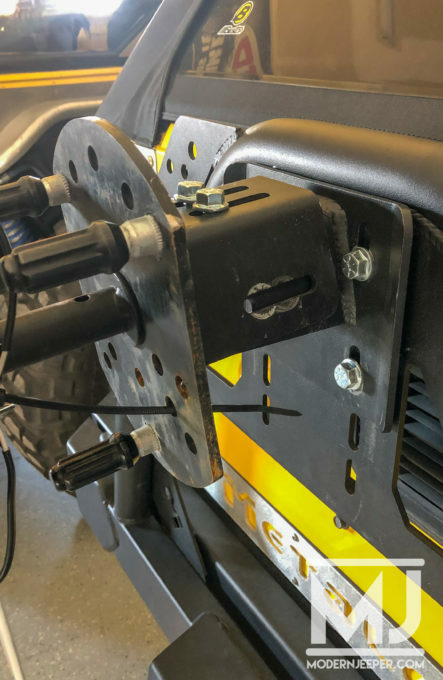 When I ordered the rear tire carrier I wasn’t sure what axles, wheels or tires I would be running, but didn’t think through why it would matter. 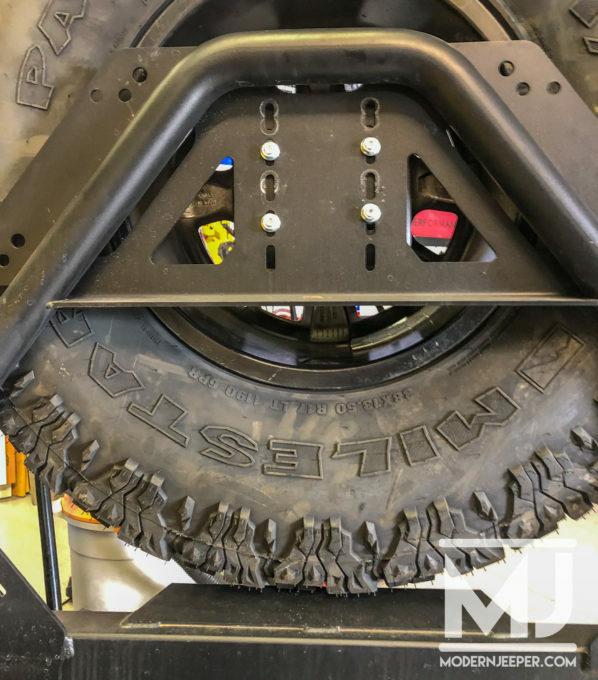 So, I ended up running TeraFlex Wide Full Float 60’s complete with 9/16″ -18 wheel studs in an 8×6.5″ pattern, along with Raceline Monster Beadlocks (RT232, 17×8.5″) with 4.75″ backspacing. 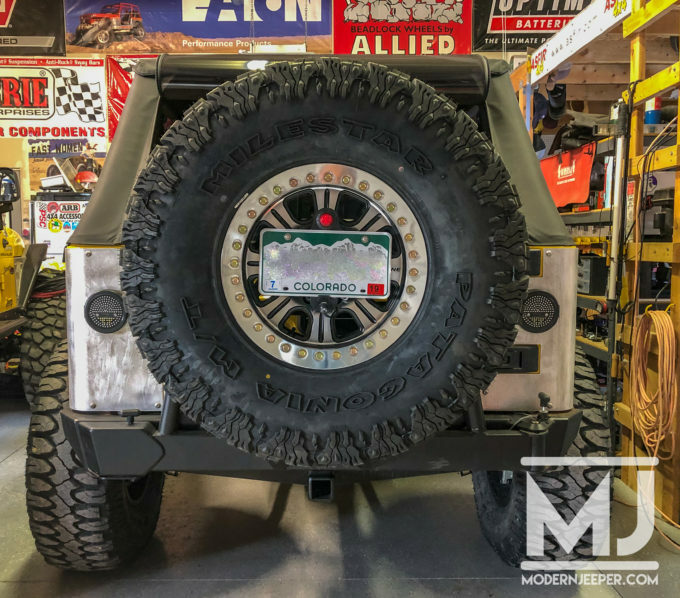 They handle the 38″ MileStar Patagonia M/T perfectly! 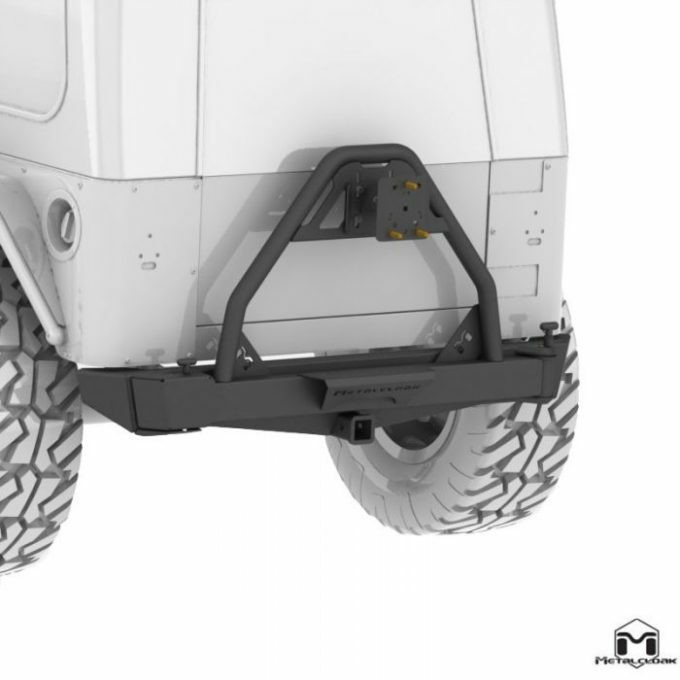 When I looked at the tire carrier’s spare mounting bracket I realized that it wouldn’t handle an 8 lug wheel. No problem! I’ll just make one! 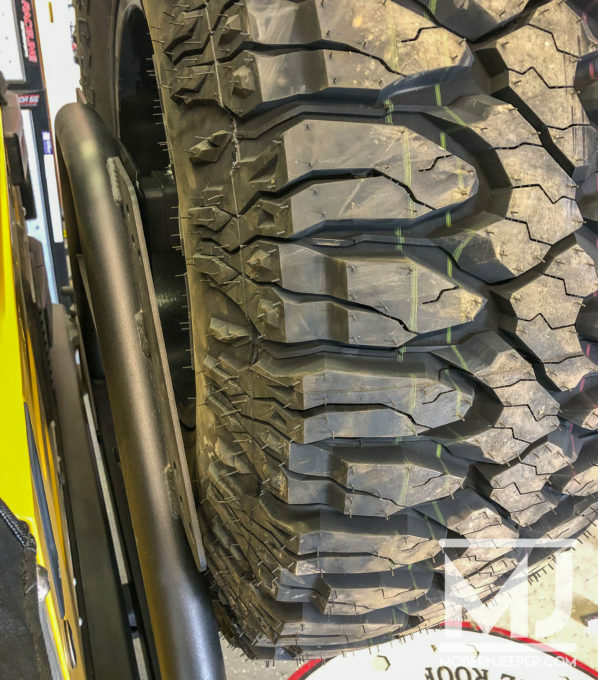 Well…with some help…from the guys at my local shop, Alpine Offroad & Performance. 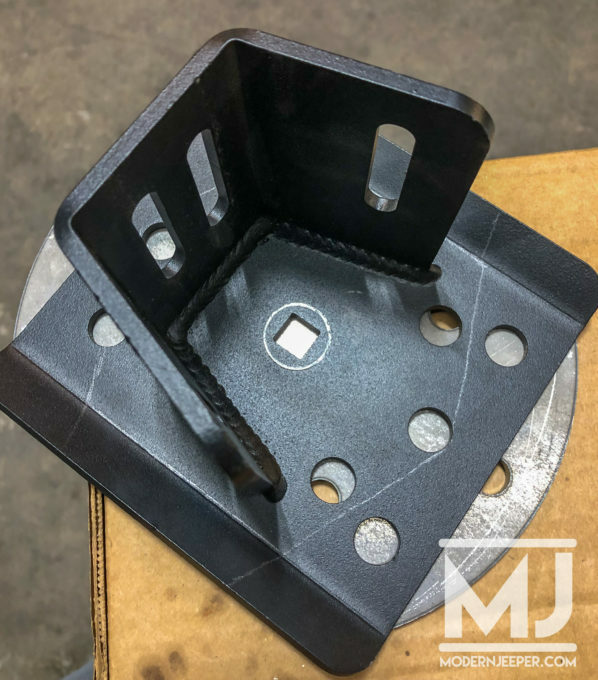 After I posted a couple pictures of my handiwork, I received a call from MetalCloak informing me that they actually make an 8-lug plate. Doh! I didn’t know…and I failed to ask! But my fabricated piece was done so I continued on my task. 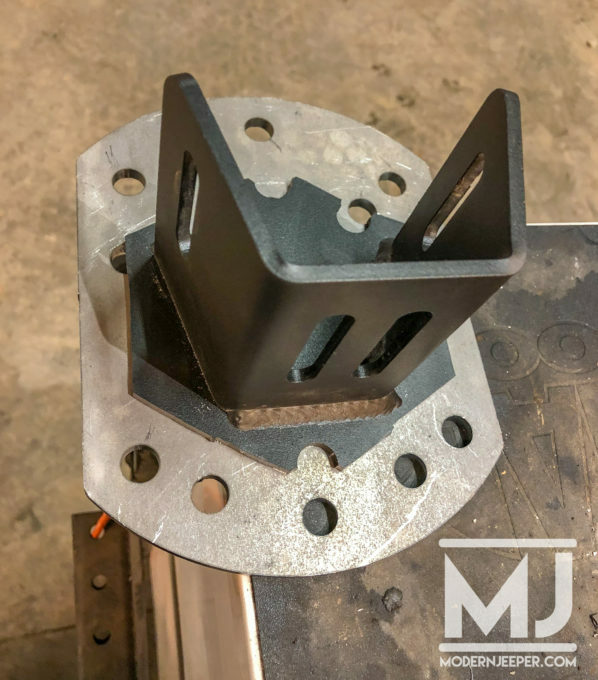 I cut the bracket that was sent with the carrier and we then welded on an 8-lug plate. 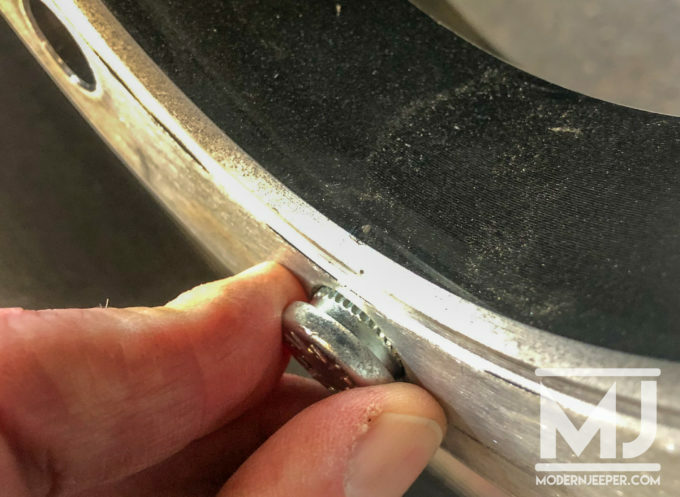 It only took a few minutes for me to realize that the fabricated plate I used came with holes for 1/2″ wheel studs, so I drilled them out to accept the 9/16″ studs. 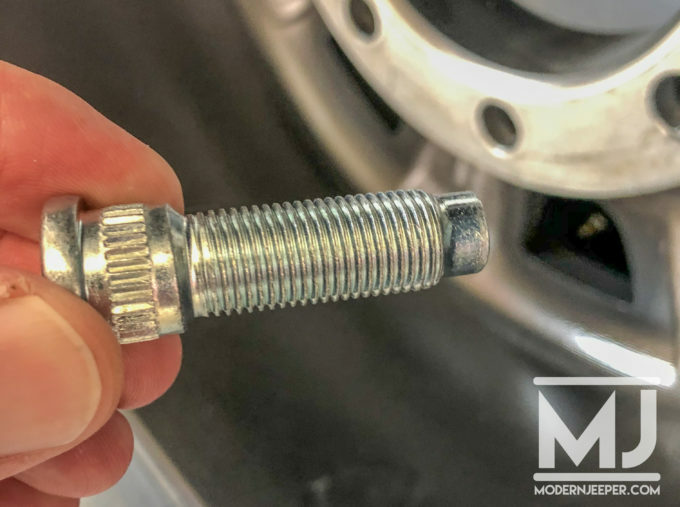 As you can see in the pictures, the shoulders of the 9/16″ studs were larger, much larger, than 9/16″. And the thickness of the plate did not take up the entire shoulder of the stud, so quite a bit of the shoulder protruded. 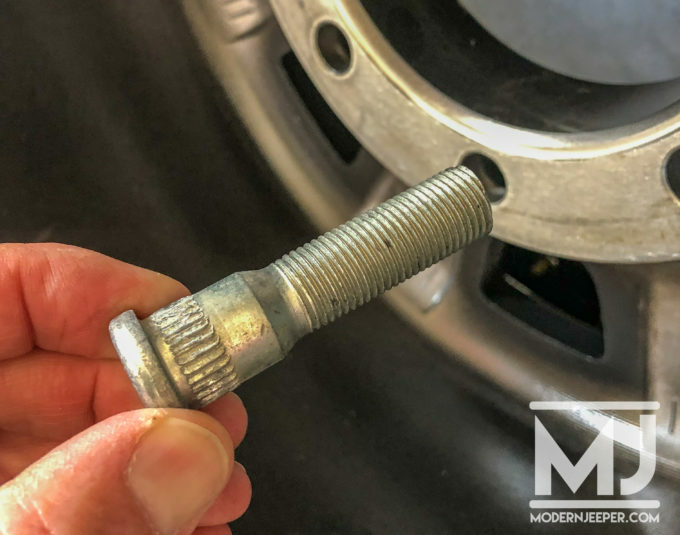 The holes on the wheels are made to accept a 9/16″ stud no problem…but not the diameter of the shoulder of the wheel stud. 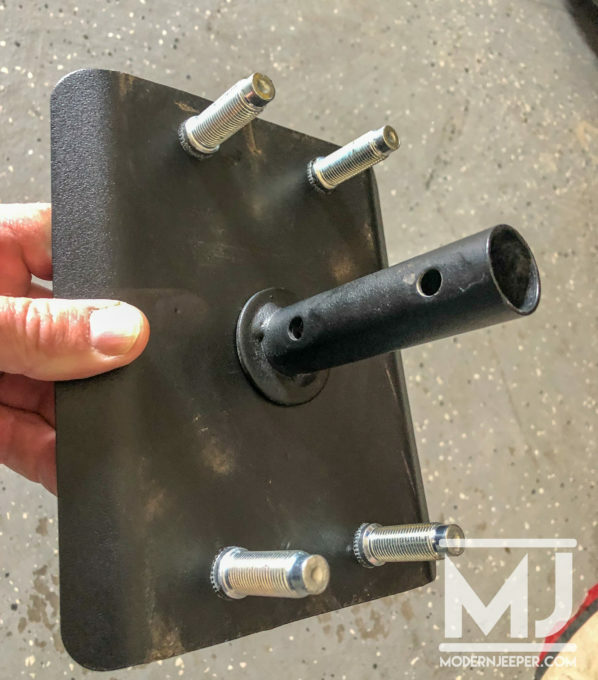 So I went in search of different wheel studs…while also contacting MetalCloak to go ahead and send me their 8-lug plate. 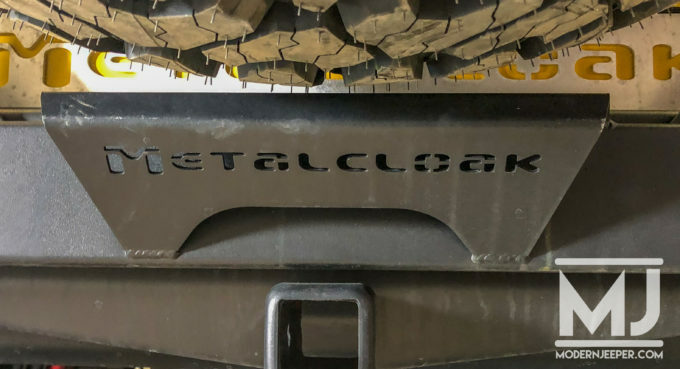 After receiving the engineered, made to work part from MetalCloak, I decided quickly to abandon my fabricated option. 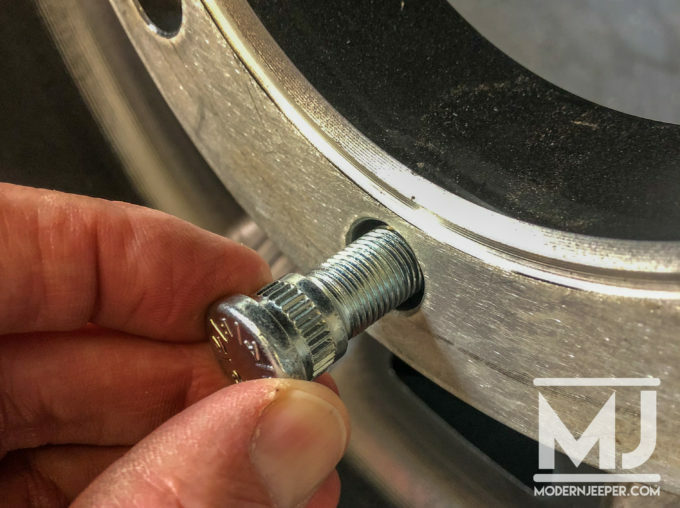 I also decided to just use 1/2″ wheel studs for mounting the spare. The shoulders of the studs fit into the wheel holes perfectly. I had a much easier, cleaner and simpler solution to my dilemma. 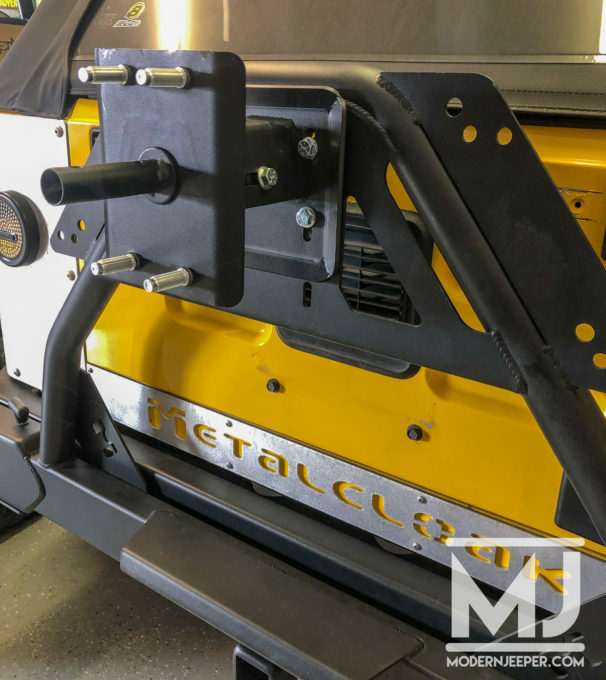 After receiving the new MetalCloak pieces, 30 minutes of work and the spare was mounted. 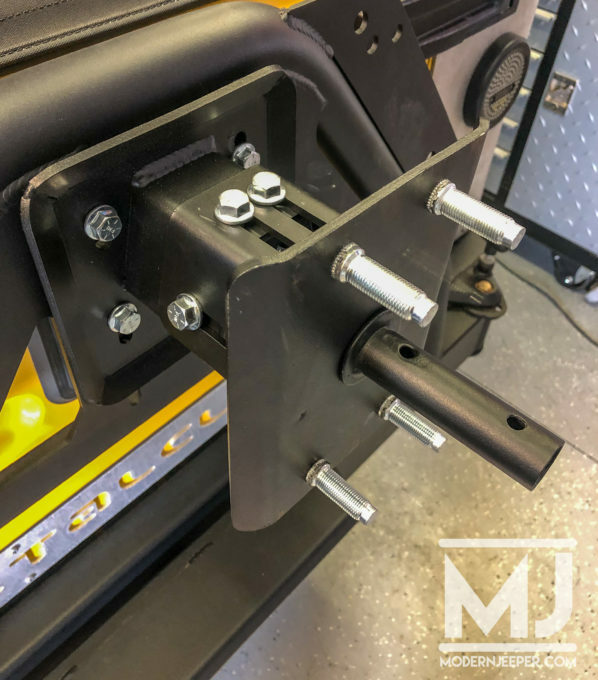 The brackets that come with the tire carrier allow a lot of adjustability for running different size tire and wheel combinations. I wanted the tire to set on the lower brace, but when I first mounted it there was still a gap. No worries! 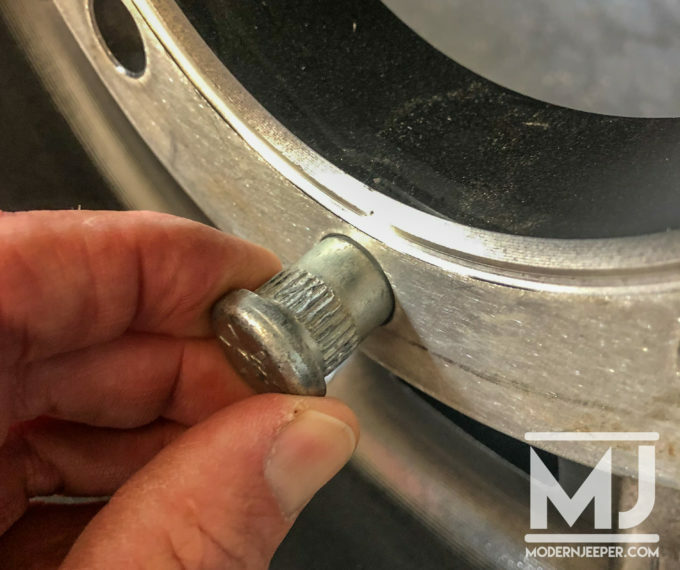 Just a quick adjustment and the tire was resting on the lower mount perfectly. Also noteworthy is that this is a large wheel/tire combination. The tire is 13.5 wide. 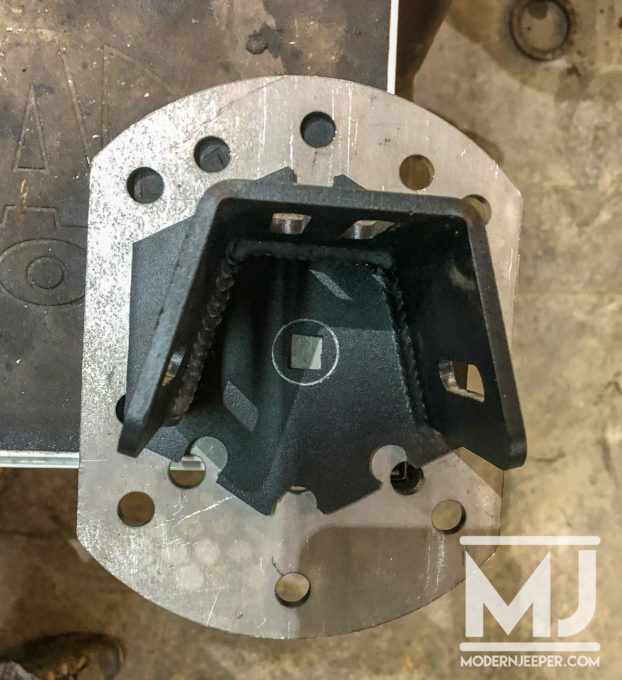 The adjustability of the mounts allowed it to tighten up without any issues at all. Another 30 minutes or so doing some wiring of the license plate light and 3rd brake light and the job was complete. Corey, Great story! I understand the frustration of trying to build it and then finding out “someone” already had thought of it and made it. 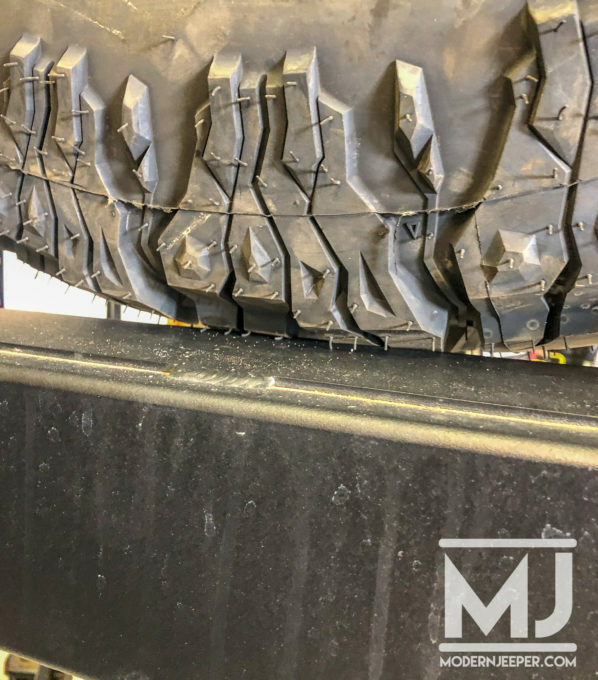 I upgraded my tires from the 265/70×17 to the 315/70×17 so I would gain a little height along with the 3″ lift which was installed. My error was when I mounted the tires & the extension I didn’t seat the lug bolts all the way. Now I will do this, but I have to remove the tire & spare parts. When I installed the stuff the first time, I had borrowed my neighbors portable crane. To fix the problem, I’ll need to make some other method. As I’ve aged, I’ve found I don’t have the strength I did back when I was in the Army. Getting older, and heavier, has taken it’s toll. Keep up the work & effort of reminding us (young or old) we need to talk with others before we start down the road to perdition!